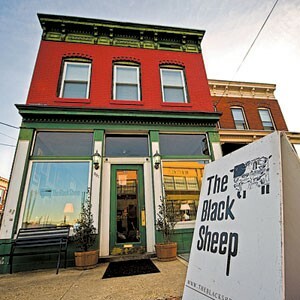 Critics&apos; Most Visited: The Black Sheep | ii | Style Weekly - Richmond, VA local news, arts, and events. The Carver neighborhood&apos;s best food landmark is The Black Sheep, where personality and a full-service kitchen earn credentials and affection. Photo by Ash Daniel. For breakfast, lunch and dinner, no place gets higher marks or more frequent visits from this group than the Black Sheep, the go-to choice for its distinctive character and affordability. The personality of this business and the portions are as remarkable as the mix of patrons and the steady performance in a chain-choked neighborhood near Virginia Commonwealth University. Partners and owners Kevin Roberts and Amy Hess are moving into their fourth year in the cafe, building on a culinary lineage from Rhode Island and New Orleans to many of Richmond&apos;s best restaurants and the governor&apos;s mansion, and a recent televised rave from the Travel Channel. Chef Roberts is adept at keeping customers intrigued with his skillful twists on classics. “I love them,” agrees John Haddad, a frequent customer. “They&apos;re not sophisticated but they&apos;re solid, consistent, I like that they&apos;re doing three meals a day, they&apos;re playful, hip and the menu is always changing. They&apos;re always packed.” And that&apos;s a good indicator.